Breathe a little...Slow down...: Gong Hei Fatt Choy! 1st day of CNY - wokeup around 8-ish am, gave Kz his red packet, then off to mil's for brunch (vegetarian food). Mil cooked: cabbage with "meen kan", varieties of mushroom with black fungus & "fun si" with "fuchuk" dish. Went to my parents' place around 11-ish am, went home as it was Kz's nap time, went back to mil's after Kz wokeup and stayed there til dinner time. 2nd day of CNY - went to Jusco Cheras Selatan for grocery shopping, went back home, went to mil's after Kz wokeup from his afternoon nap. Nothing much to do as most visitors came on the 1st day of CNY. 3rd day of CNY - went to my aunt's place for lunch, went back home for Kz's nap, went to hub's friend's place around 4-ish pm, went to Taman Billion Sweed's cafe for a simple western dinner. 4th day of CNY - Boiled beef soup in the morning (beef, potatoes, carrots and onions). And since we have no more friends to visit, decided to bring Kz to the paed as the clinic has already opened today. Just for consultation and a peace of mind (he has ugly ridges on his left last finger since few months ago). Paed said it was nothing. If it was malnutrition, it would have been on his 10 fingers, and not just 1. Made sense. Well, paid RM30.00 for a peace of mind. Went home. Wait for Kz to nap. Went to mil's for dinner (overnight food). Simple day. 5th day of CNY - Valentine's Day! Sent Kz to the nanny in the morning, hubs and I went to Sunway Pyramid mall to celebrate some couple-time and Valentine's day. Bought some groceries at Jusco. After that, we still had time before the restaurant opens at 12pm. I bought two new pairs of shoes. Finally, at 12pm, buffet lunch at Shogun Japanese restaurant. 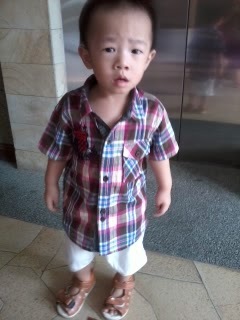 Left the mall around 1.30pm, picked up Kz from the nanny and stayed at home for the rest of the day. Had instant noodles and bread+tuna for dinner as we were still very full from the buffet lunch. Cooked simple maceroni+cheese for Kz for dinner separately. 6th day of CNY - Sent Kz to the nanny as usual. Hubs fetched me to work (yes, I started work already. Hubs will start work next Monday). Hubs will have his own activities today, which he called it his "freedom day", haha. He will go for "cha kar chap" with his family after he fetched me to work. Then I think he will go for a movie, hair-cut, buy diapers for Kz, etc. He will pick me up afterwards at 5.30pm. No fancy dinner as we will heat up leftover food in our fridge tonite. There's soup and white-cut chicken from mil, chicken feet mushroom from my mum. Sigh.